Imagine that when you dream, you pass into a different universe, where you can try experiments and behaviors and then undo them, so as not to have the consequences. Or imagine that the world that you live in is fake, and manipulated by others at a parallel or underground level. Okay, that gave us the Matrix movies of Andy and Larry Wachowski, with the lean and ascetic hero Neo (Keanu Reeves) and some wonderful and ironic excerpts or clips of our civilization presented at the pleasure of the storyteller (I remember especially the endless circular sequences in the “Toronto subway.”) In fact, the visual and animated reconstruction of the destroyed “real world” above ground at the end of the last movie was quite compelling. So the Wachowski’s are at it again with Speed Racer (somehow I almost typed "Blade Runner") again from Warner Brothers and Australian production company Village Roadshow, which often partners witn WB. Actually, most of the filming was done in Germany. The film showings are available in two versions, regular 35 mm but 2.35:1 but looking quite crisp, like regular high definition (try to see it in a digital auditorium), and 70 mm Imax. I was annoyed at a local Regal multiplex, which doesn’t tell you which performances are in the 4 out of the 12 auditoriums are large. I don’t like to see theaters show 2.35 : 1 by cropping off the top and bottom of a screen in an auditorium that is just not wide enough. Remember the remodeling that neighborhood theaters had to do in the 1950s to show Cinemascope (starting with The Robe from Fox in 1953)? The Wachowski’s have created an alternate world in animation, patching together geographic features for the “cross country’ race in the story from various countries around the world (for example, the movie pretends tunneling the Matterhorn with caves). 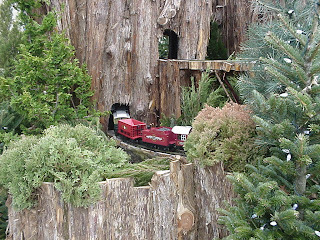 The creative effort reminds one of a huge model railroad layout. It looks a bit clownish (more than comic-book-like), reminding me of Prodigy in the early 1990s. There is a huge city, a kind of Metropolis (Smallville) with elements of LA, Hong Kong, Singapore, Kuala Lumpur, and most of all, probably, Dubai. (The cross country race starts on Arabian desert sand dunes. I think they could have shown the artificial “Palms” in the Arabian sea with effect.) The film dazzles us with primary colors, in patterns constantly fascinating for the eye. I recall a Kodak film demonstration at the Heights theater north of Minneapolis during an IFPMSP film festival, showing hue and saturation; this film develops digital colors to their most intense saturation. The story is touching if artificial. The actors are “real” and mostly perform against green screens. Speed Racer is played by a noble Emile Hirsch, and it’s nice to see the actor earn a happy ending after the agonizing end his character comes to in “Into the Wild” (see this blog, Sept. 30, 2007, follow the archive links on the left). The opening scene is funny for teachers: young Speed is struggling with the SOL’s under NCLB, filling out a multiple choice reading test, and all he can think about is cars. His brother’s mysterious death inspires him, and then he finds that corporate interests want to fix races. (Any surprise?) The script makes a lot of Speed’s obligations to his family: parents, and brothers (one of whom is a chimpanzee, who is presented as a human). No doubt "Speed Racer" will become a franchise, with films II and III. But, unlike the case with The Matrix, there is no real suspense and it's hard to imagine a compelling followup.